I like to read cookbooks like they’re novels. I curl up on my couch and dive in. 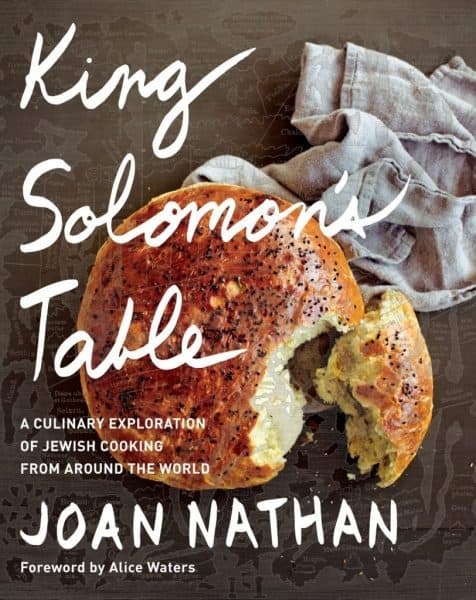 I just spent my Sunday afternoon glued to Joan Nathan‘s new cookbook King Solomon’s Table: A Culinary Exploration of Jewish Cooking From Around the World (affiliate link), and I couldn’t put it down. Sitting with her book is like sitting with a captivating dinner guest. This is Nathan’s best book yet, which is saying a lot given that she has already won multiple cookbook awards for her previous works. Nathan’s new book is a culinary journey across time and place with gorgeous full-page color photos to match. As the adventure unfolds, Nathan has a knack for making me feel like I am right by her side. 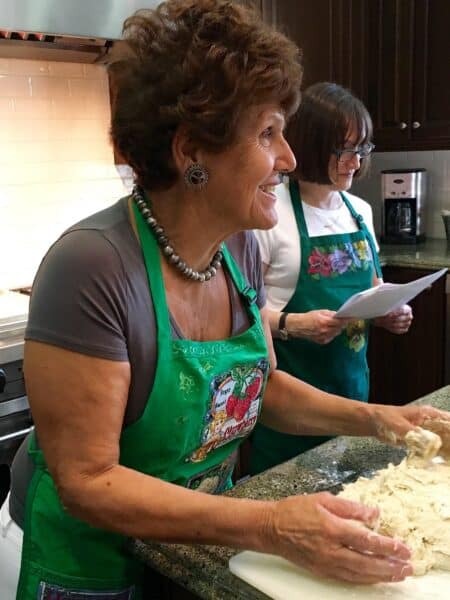 She has spent a lifetime gathering recipes from Jewish home cooks and chefs across the globe. From these experiences, Nathan has amazing stories to tell, and she is a master storyteller. The beauty of the book is that each recipe comes with a backstory about how she obtained the recipe or about the historical roots of the dish. 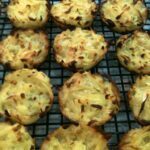 As she describes meeting home cooks in faraway villages, I can imagine walking down the cobblestone streets with them on the way to shabbat dinner. And I can picture being in her kitchen as she recounts an impromptu matzo brei cook-off competition that took place one Passover. What shines through in the book is Nathan’s contagious spirit of adventure as well as her desire to capture the beauty of Jewish food around the world. 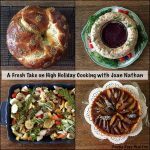 Nathan showcases the rich diversity of Jewish cuisine with over 170 recipes from numerous countries including France, Italy, Morocco, India, Iran, Poland, Mexico, Brazil, the United States, and more. 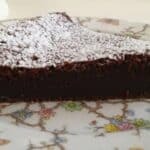 The recipes include her latest acquisitions plus some updated versions of classic recipes that she has tweaked over time. This collection is a snapshot of Nathan’s current recipe box, which is dynamic and ever evolving. She is insatiably curious and driven, so her work is never done. She still wants to explore more regions for traditional Jewish recipes, and is equally interested in modern iterations and new fusions. Joan Nathan in action in my kitchen making challah. Although Nathan gathers her recipe ideas in the field, she doesn’t print exactly what is scrawled on each piece of scrap paper that gets handed to her in chefs’ kitchens and village homes. Nathan is a thorough recipe developer. She makes variations of each recipe until it is just right. Sometimes she combines ideas from several recipes to create the ultimate version of a dish. Everything is tested on American home appliances with ingredients that are widely available. At the end of the process, every recipe is reliable and geared toward the home cook. I am so enticed by the many recipes in this book that my copy is filled with dozens of Post-It’s marking specific recipes. The ones I want to make include: Passover Tabbouleh with Apples, Walnuts, and Pomegranate in endive spears; Matzo muffins; Moroccan Lamb Shanks with Caramelized Onions and Dried Fruit Sauce; Indian Chicken with Cardamom, Cumin, and Cilantro; Herbed Labneh with Beets and Lentil Salad; Roman Ricotta Cheese Crostata with Cherries or Chocolate; Hungarian Golden Pull-Apart Cake with Walnuts and Apricot Jam, and Montreal-style bagels. I can’t wait to get cooking! 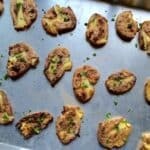 I had a hard time narrowing down which Joan Nathan recipe to share with my review until I had a recent experience with a fellow Joan Nathan fan in an unlikely place. 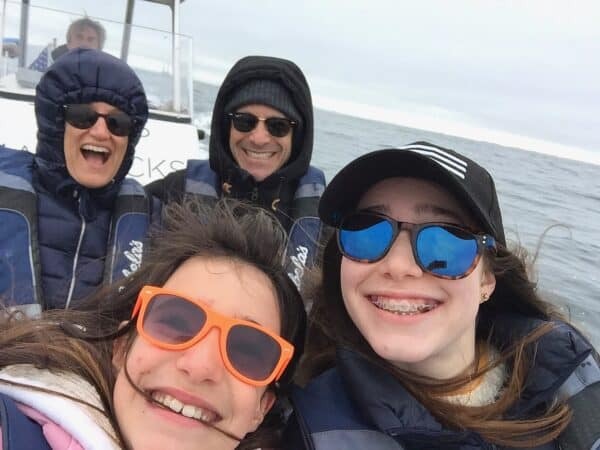 I went whale watching in Monterey, California during Spring Break vacation with my family. When we arrived at the dock, I spotted our boat captain Phil standing next to his shiny boat. He looked the part with his wind-swept hair, skin tanned from the sun, anorak jacket, and knee-high fishing boots. As soon as we met, he asked me about my Foodie Goes Healthy email address that I used to make the boat arrangements. I explained that I am a food blogger. He said that he, in fact, had already checked out my blog because he loves to cook. He was excited to see my blog post about my cooking class experience with Joan Nathan. It turned out that Phil is a big fan of hers and has made every recipe out of her original cookbook, a 1978 spiral-bound book which he took off his mother’s shelf. I loved discovering this unexpected connection with him, and we continued to talk about food. My favorite story that I heard from captain Phil is that Joan Nathan inspired him to make haroset recipes from around the world. 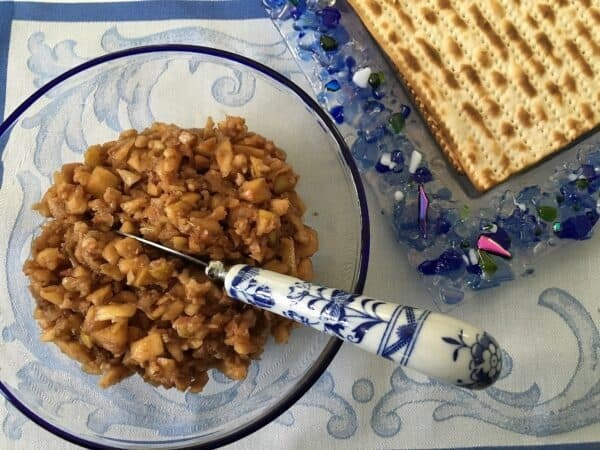 Haroset is a delicious fruit and nut topping for matzo and is served during Passover, the springtime Jewish holiday. Every year for Passover Phil makes a different haroset from a different country, and his family tries to guess what country the recipe is from based on the ingredients. So far he has made haroset from ten different countries. What a fun tradition! 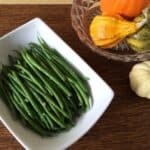 In addition, he always makes a second haroset which is his family’s beloved apple haroset; otherwise, he thinks his family would revolt if that weren’t on the table. His second haroset is very similar to my aunt’s apple haroset which I make every year too. My aunt’s apple haroset at our Passover seder. Phil’s Passover tradition of making a haroset recipe from around the world sounds so cool that I want to do it too. Thankfully, Nathan’s new book has five versions to choose from to get my new tradition started. For the first year I have chosen Persian Haroset and am sharing the recipe below. I wonder if my family will guess which country it’s from. Just when I thought I had the best plan to jazz up Passover, I learned about an even crazier idea for the ultimate fun with haroset: a haroset bar. 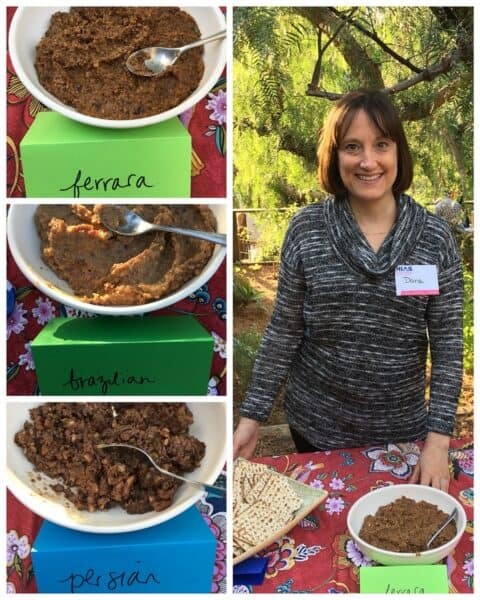 At a Los Angeles book launch party for Joan Nathan this week, her daughter set up a buffet of different kinds of haroset all labeled and on their own separate table, like a place of honor. They started off with three types of haroset from the new cookbook. Then as the night went on, guests showed up with even more kinds of haroset and added them to the bar. I loved tasting so many different ones and comparing them. It was interesting to see how the specific ingredients reflected what’s readily available and popular in each region. For example, the Maine version was made with blueberries, and the Tuscan one was made with chestnuts. Furthermore, everyone’s interpretation of a recipe was a bit different. Some were left extra chunky, while others were very smooth. Some had a pronounced flavor of one ingredient, like banana or Manischewitz wine. Others had a more even balance to the components. The atmosphere around the haroset bar was lively as people compared notes and connected over food. The bar represented the essence of King Solomon’s Table, which is a celebration of the variety of flavors and ingredients around the world. And Nathan wants everyone to come along to explore and enjoy Jewish cuisine with her. After my haroset tasting experience, I have a clear game plan for how I’m going to execute Nathan’s Persian Haroset recipe. I’m aiming for an even balance of flavors and will leave it slightly chunky as Nathan recommended. For presentation, I want to scoop it into little balls served on each person’s plate. I’m excited to bring Joan Nathan’s spirit of adventure to my seder table. This haroset recipe is from Joan Nathan's cookbook King Solomon's Table: A Culinary Exploration of Jewish Cooking From Around the World. The Middle Eastern spices of the dish add exotic flavors to the Passover seder dinner table. Note on buying the ingredients: I recommend getting the dried fruits and nuts from the bulk bin of a health food store or Middle Eastern market. That way you can buy just the amounts needed for the recipe. Try to go to a store with fast turnover so that the ingredients are fresh. Consider cutting this recipe in half, depending on how many guests you have and how many different kinds of haroset you are making. A whole recipe makes about 32 small balls, measuring 3 tablespoons each. In a large food processor, combine the almonds, pistachios, walnuts, black and golden raisins, dates, cinnamon, cardamom, ginger, and nutmeg. Pulse until the nuts are coarsely chopped. Add the apple, pear, and bananas, and pulse until coarsely chopped. Add 2 tablespoons of the vinegar, ½ cup of the pomegranate juice, and ½ of the cup wine. Pulse again, adding more vinegar, juice or wine to taste, or as needed to make a coarse paste. Do not purée; mixture should retain some crunch. This recipe was re-printed with the permission of the publisher. For a real treat, come meet Joan Nathan in person at one of her book tour events which are posted on her calendar. I was given a copy of the book by the publisher. All opinions are my own. This post contains Amazon affiliate links which means that if you make a purchase through a link, you will not pay anything extra, and I will receive a small commission to help sustain this blog. What a beautiful post, Dana! Joan Nathan is always a source of inspiration and it sounds like her new book is no exception. I especially enjoyed reading about Captain Phil and his appreciation for haroset and Joan Nathan! Such a small world. I like the idea of serving haroset rolled in balls for each guest. I’m making a note of that for next year. I hope you had a delicious, meaningful Passover celebration! You have beautifully captured the essence of this amazing book. Like yourself, I spent my entire Sunday curled up on a couch reading this intriguing book. Now off to cook from it. Great job Dana. Thank you so much, Cathy. I’m looking forward to hearing about what you make out of the book. The photos make everything so enticing.